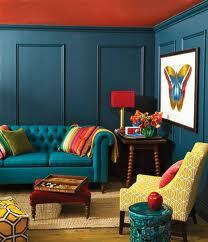 A punch of this color in any room or in your wardrobe makes a bold, bright and rich statement. 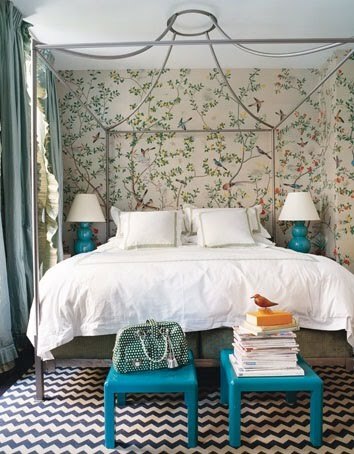 I have always loved this look from Miles Redd and the late great Domino Magazine. It’s held up since it’s publication in 2005 and will continue to do so for years to come. The garden stools add a great pop of color and pull the seating area together. The color looks great with the neutral background and also with other strong colors such as the gorgeous deep eggplant bench. This settee below is a real statement piece. It actually would look great in my master bedroom. Just saying…. Domino did it again with this room. 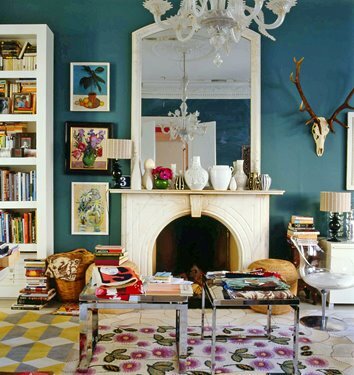 The paint in conjunction with the different textured rugs and white mirror and chandelier makes the room bright, contemporary with a little classic twist, a great curated look. The blues in this room with the orange ceiling are dynamite. I always love this color with a golden yellow. You can see how well they work together with the side chair. Are you kidding Windsor Smith? 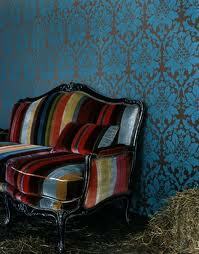 The striped fabric on the settee and wall paper make me swoon. I was just in NYC and I popped into The Rag & Bone Store in the West Village. I found these jeans and had to have them. My dear husband started humming “Jump” By Van Halen when he saw me in them at the store. He came around when he saw them paired with a simple black cashmere sweater and black flats. He agreed that they were not too “David Lee Roth” and now they are one of his favorite on me. I have an obsession with china and dish ware. I dream one day of having a “China Room” where I could store and display all my sets and the ones that have yet to be discovered. I want floor to ceiling glass cabinets that are lit from the inside….I digress. 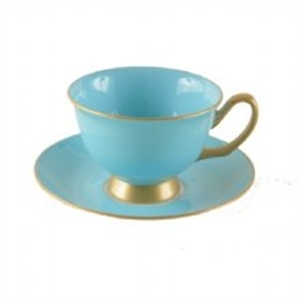 I love this little tea cup and saucer and the color would work with a gold rimmed china set. The splash of color adds sophistication and a touch of whimsy to a dining table. 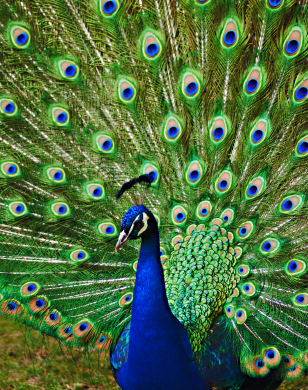 The power of the peacock does not stop at decor and fashion. Check out the Peacock Feather Cupcakes. To die for, especially with the devils food cake peaking out under the frosting. Yummy and Gorgeous. So add a little pretty peacock pop to your life! I too wish for a floor to ceiling lit cabinet for china, and also for glassware. I am addicted and would have much more if it didn’t have to stay hidden away from view. 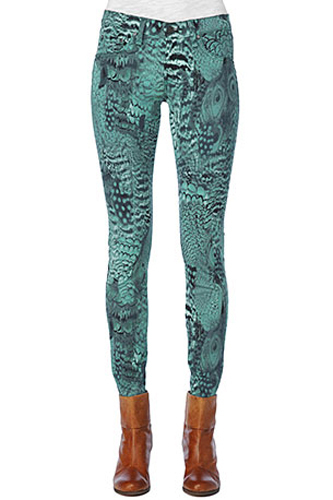 And your jeans have me peacock green with envy. Amy, you’re a girl after my own heart. Thanks for reading! the interior pics are really inspiring and beautiful! and the jeans look great, too!